Once a fortnight I am going to do my own product spotlight. I will try to do a tutorial as well, however just going to start with a very simple post, highlighting a new product from the catalogue that is now in my collection. 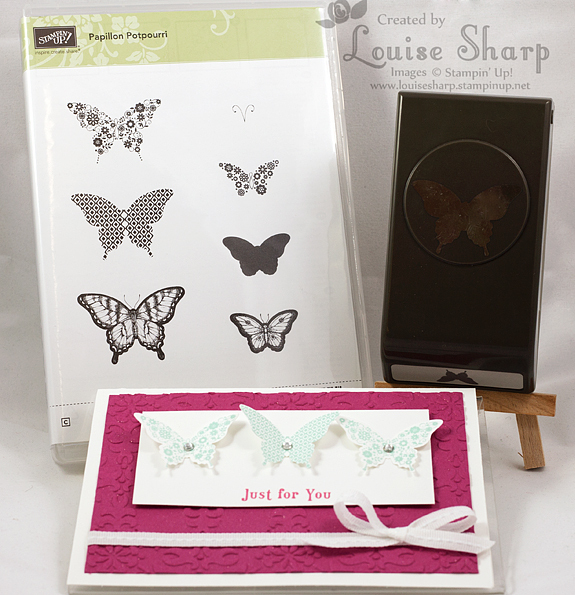 I am thrilled to add to my collection the new Papillon Potpourri butterfly stamp set on page 115 and the new matching Elegant Butterfly Punch on page 184. I believe these are a 'must have' for any stampers collection. This card was used as a make and take at a recent card party. It was a huge hit and one lady even referred to this set being like a 'staple' item for any stamp collection - I have to agree! I hope you enjoyed my very brief Product Spotlight. I will upload some more cards using this set very soon - as I just love it! I love that set too! Great card!